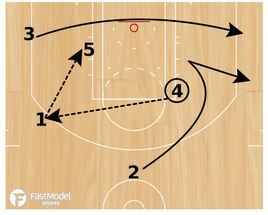 This play run by the San Antonio Spurs was submitted by Wes Kosel, Men’s Assistant Basketball Coach at Colorado College to the FastModel Sports Basketball Plays and Drills Library. 1 starts on the wing and passes to 2 at the top. 2 passes to 4 at the weak-side elbow (pinch post). 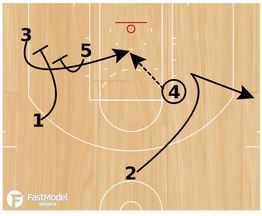 Once 4 has the ball, 2 loops around 4 looking for the hand-off. In option 2, the hand-off isn’t there so 2 pops out to the wing. 3 runs the baseline to the opposite corner. 1 looks inside to 5 posting up. 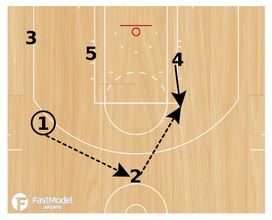 In option 3, 2 cuts to the wing after the hand-off isn’t there. 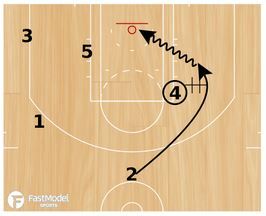 1 and 5 move towards the corner to set a staggered screen for 3. 3 cuts into the lane looking for the pass from 4. I am looking for a play you had on twitter previously and I cant find it anywhere. The Spurs ran it and it involved 2 guards spread at top with a high post. one guard entered it to post and ran off for a fake handoff, meanwhile the other guard came the opposite direction and received a handoff. do you recall this play. I think there was video of it.